Tennessee’s former Athletics Director is reportedly getting another shot at running an athletic department. According to a report from David Glenn of The Athletic, Wake Forest is expected to announce on Monday that current Athletics Director Ron Wellman is retiring, and his successor is expected to be former Tennessee AD John Currie. Currie graduated from Wake Forest in 1993 and is expected to be announced as the Demon Deacons’ new AD on Monday during a press conference. Currie served as AD for Kansas State from 2009-17 before he was announced as UT’s AD in April of 2017. But Currie’s stay at Tennessee was short lived. Currie’s tenure as Tennessee’s AD lasted just eight months. Once he fired the Vols’ head football coach, Butch Jones, he was tasked with finding Tennessee’s next head football coach. Currie’s first selection was Ohio State defensive coordinator Greg Schiano, and the two sides were close to an agreement before Vol fans, politicians, and media members voiced their displeasure. There was massive backlash to reports of Schiano’s hiring due to his ties to the Jerry Sandusky scandal at Penn State, and eventually Tennessee backed out of their initial agreement with Schiano. Over the next week, Currie scrambled to try and find a new head coach, but he was rejected by several candidates including Oklahoma State’s Mike Gundy and N.C. State’s Dave Doeren. Currie eventually went rogue and flew out to the west coast to offer the job to Washington State head coach Mike Leach against the wishes of then-Chancellor Beverly Davenport. Davenport ordered Currie to return back to Knoxville, and on that Friday morning on December 1st, it was announced that Currie was put on administrative leave and was suspended from his duties. Later on that day, former Tennessee head football coach Phillip Fulmer was named as UT’s new Athletics Director. Six days later, Fulmer hired Alabama defensive coordinator Jeremy Pruitt to be the Vols’ next head coach. 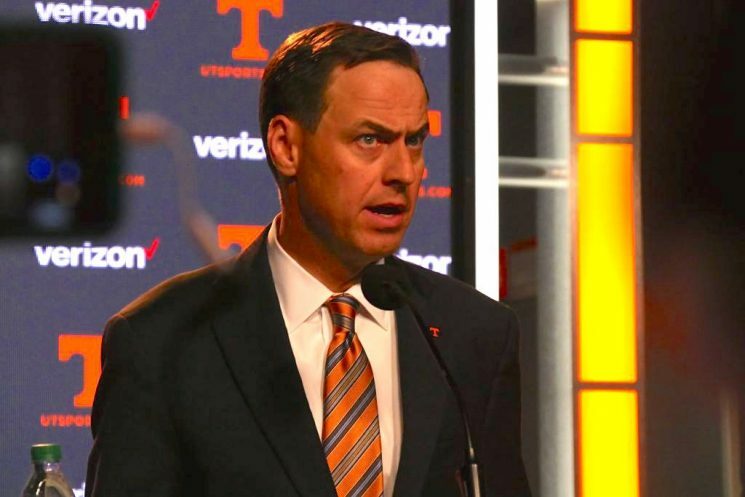 Tennessee later announced it had come to a $2.5 million “separation agreement” with Currie, who had signed a five-year contract to be the Vols’ AD originally. One of Currie’s primary tasks at Wake Forest will be to get the Demon Deacons’ basketball program back on track. Wake Forest’s men’s basketball team is currently 11-17 this season under head coach Danny Manning. Unless the Demon Deacons go on a miraculous run in the ACC Tournament and win the title, this year will mark the eighth time in the last nine seasons that Wake Forest has failed to make it to the NCAA Tournament. Wake Forest hasn’t won an NCAA Tournament game since 2010 when — ironically enough — they defeated a Rick Barnes-led Texas squad in the first round. Currie reportedly had a strained relationship with Frank Martin at Kansas State when he was the Wildcats’ head coach in men’s basketball. After Martin left Kansas State to go coach at South Carolina, Currie hired Bruce Weber to serve as the Wildcats’ head coach. Kansas State has made four NCAA Tournament appearances in Weber’s six previous seasons as their head coach, and his seventh year at the helm looks like it will result in another NCAA Tournament berth.